​Tin, the major constituent of pewter, is produced from tin ore, the major sources of supply being the Far East and South America. Tin is completely non-toxic, melts at a relatively low temperature (232C), has very good fluidity when molten, has good formability, and readily forms alloys with other metals. It is a relatively soft metal and it is for this reason that it is alloyed with other constituents before being used in the form of pewter. Please see Manufacture for more information on how the metal is fashioned into objects. The Pewterers' Company has a fine representative collection of British pewter including many pieces of historical importance and items of quality contemporary pewterware. Click on Discover the Collection to see highlights of the Pewterers Collection. Pewter is essentially tin, but to be worked it has to be mixed with other metals. In past centuries the Company laid down strict specifications for the alloy and up to the end of the eighteenth century monitored pewter manufacture throughout England. The alloy used today in pieces which display the quality touchmarks of the Association of British Pewter Craftsmen is in the range: tin 91-5% minimum, copper 8% maximum, antimony 2.5% maximum and bismuth 0-5% maximum, as determined by the European Standard for pewter. Modern pewter contains no lead. Please note the Worshipful Company of Pewterers does NOT accept enquiries regarding pewter marks or repairs. darkened, engraved, etched or hammered. It may also be painted, enamelled or decorated. 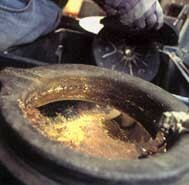 If the artefact is unsatisfactory, the metal can be melted down and reused without loss of quality. The alloys are made up in large iron-melting pots and, after melting and thorough mixing, the alloy is cast into ingots for producing cast pewterware or slabs for subsequent rolling into sheets. alloying rolling In the alloying of pewter it is important that the mix is accurately controlled both on quantities and temperature for repeatability. Once manufacture procedures have been established in a pewter workshop, it is essential that the supply of raw materials is consistent from batch to batch, whether it be for casting ingots or for sheet materials. The slabs of pewter in their 'cast form' will have a rough surface and the upper surface will have considerable shrinkage marks and depressions. The upper and lower surfaces are therefore machined off. The slabs are then passed through banks of rolling mills which progressively reduce the thickness. It is important that the rolls of these mills are polished to ahigh finish and every care must be taken to keep the sheet clean to avoid letting dirt or other foreign substances into the surface. During the reduction process, the pewter softens quite considerably from its original 'cast' hardness. This is mainly due to a reduction in crystal size and distribution caused by the rolling and reducing action. 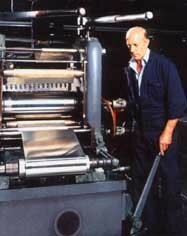 The rolling and reduction continues until the desired sheet thickness is reached. 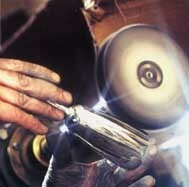 Spinning is a metal-forming technique, done on a suitable spinning lathe, by which flat sheet can be easily formed into hollow vessels. Using formers or burnishers, the spinner works the pewter discs onto former chucks which come in many and various shapes and sizes. There are several videos of Spinning online such as this video Pewter, A Tudor Pewter Tutorial by A E Williams for Hampton Court Palace. Pewtersmiths are experienced in soldering which makes it one of the most important techniques in the pewter workshop, as it is the standard method of joining individual components to form an assembly. When carried out with skill and the correct materials, the joints are extremely difficult to detect. Using various solder alloys for the many varied items made nowadays, the pewtersmith has to use his skill in bringing the components to a soldering lamp, or in certain circumstances the lamp to the component. 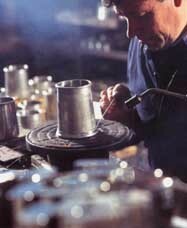 Casting is the oldest method of producing pewterware and in some countries it is still the dominant method. 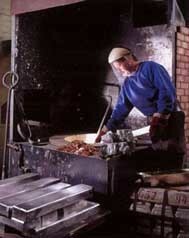 Gravity casting into permanent metal moulds is the traditional and most widely-used technique of producing cast pewterware. Slush casting is a method of making hollow castings without the complexity of using cores, particularly where the profile or surface finish of the inside is relatively unimportant. This makes it an ideal method for reducing the weight of a handle or other attachment to a main article without upsetting the balance or feel. Rubber mould casting by the centrifugal method is, today, a very common method of producing small items quickly, accurately and to a high standard of finish and complexity. Impressions are formed in two thick circular sheets of rubber, which are then clamped together. The top sheet has a central hole which connects with runways in the rubber which lead to the impressions. Molten pewter is poured into the central hole of the top sheet, whilst the mould is rotated at high speed. The pewter is forced along the runways into the cavities by the centrifugal force. When the metal has cooled, almost immediately, the two halves are parted and a radial display of cast parts is seen. Finishing is the last process in the production of a piece of pewterware, but is by no means a technique tacked on to the end of the other processes. 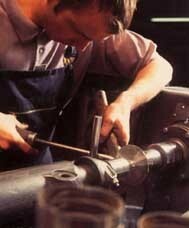 It is the finish thatdetermines the final appearance and characteristics of a piece of work. Firstly, stitched mops dressed with abrasive compounds are used to cut away the surface, to remove irregularities and imperfections. This is then followed by the final polishing on swansdown mops, using a rouge based compound. This gives an extremely fine, sometimes mirror, finish and brings out the colour of the metal. It can be seen that there are many different skills in the making of pewterware, too many to fit into this short introduction. The skills mentioned have been handed down over the centuries and the craftsmen of today are still proud of their heritage. We owe them all a debt of gratitude for their continued efforts to turn out superior articles of beauty. Please note the Worshipful Company of Pewterers does NOT accept enquiries regarding pewter marks or repairs. Go to PEWTER for alternative contacts. © 2018 Osiris & Ciceroe Design. Pewter Marks Pewter marks or touches can be informative and rewarding or complicated and frustrating! Sometimes there are none at all; sometimes one can tell the maker, the place of manufacture and the year from the touchmarks. 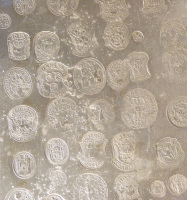 Originally all touchmarks were kept at Pewterers' Hall on large lead touchplates ( for more information on the touchplates see pages 16 - 17 0f the Pewter Review 2015). These melted in the Great Fire and the ones used after 1666 are now kept at Guildhall for safekeeping. The habit of touching died out as the trade diminished from the 18th Century and the power of the Company to control quality also waned. Recently, however, the tradition has been revived and with it the ability to identify modern pewter with some degree of confidence. Detail of a lead Touchplate 1666 The Touchmark Ceremony is a long established tradition with records of ceremonies within the Company from 1474 when the Company was granted a Royal Charter. Prior to these ordinances, the earliest record is 1348, related only to pewterware offered for sale in the City and made in the City and sent for sales ‘to fairs, or to markets or elsewhere in the kingdom’ probably made in many other cities, of which those of York, Coventry and Bristol have survived. These ordinances were enforceable only under the City Corporation and not by the Pewterers.